It's important to have a team in Palm Beach County for Junk Hauling services when you need them most, even late at night and during the weekends. XS Trash can offer a variety of flexible and reliable debris removal services tailored to your budget and requirements. Get in touch today to learn more about our skilled team. From same-day scheduling to in-house Bobcat operators, XS Trash is proud to be a trusted and highly rated source for dedicated and comprehensive junk removal services. 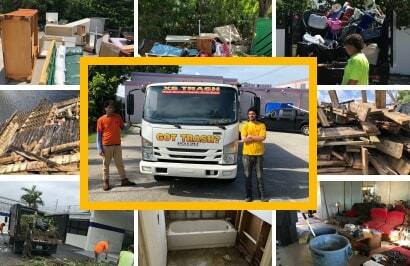 When it comes to businesses and residents in Palm Beach County, junk hauling can be price matched to our lowest minimum, so you know you have the best team at the lowest prices. Whether you have a single bulk item to remove or several bed loads of heavy debris material like metal sheeting or concrete, XS Trash can help you eliminate unwanted rubbish. When we've finished rounding up your debris, our team can go back over the area for a final clean sweep. This way, you can enjoy a spotless result without the need for extra hassle on your end. Always aiming for 100% customer satisfaction for Palm Beach County junk hauling, XS Trash works hard to donate and recycle all eligible items, as part of our commitment to sustainable debris removal practices. Currently, we recycle up to 40% of each load and work hard to improve that number. The best part? All recycling and transfer fees will be included with your estimate. Call today to get started with price matching. Licensed & Insured Palm Beach County Junk Hauling, Junk Pickup & Hauling Company.